That's what I'm talking about! Companies should do a presentation of the product like this and then we would go for it like bees to the honey! Awesome! Omg! And this is just the steel, wait for the slips!! Knocked out blufans steel imo. Awesome, cant wait to see slips. Should've had Red Skull on the back of the steel though. 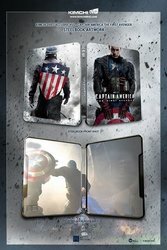 Now I hope they do 2 full slips and 1 lenti like for TWS. *__* So gonna order a one click. Thanks for the tag @harry . Meh, this is quite a few years late. Not gonna buy this movie again. Full gloss and debossed title. Looks more like spot gloss, no? Front looks solid, but why'd they crop off the top of his head and dismember his legs on the rear?